Photography website – an ongoing discussion in the industry, and one that has no solid answers. I’m hoping to change that with the best possible advice I can give. One of the more common questions I receive from photographers is about websites. More specifically, questions about how to build a website for their hobby or for their business. At the end of the day, what method you use for building a photography website comes down to need and technical ability. My friend Bryan talks a bunch about a photography website at his article on Sprouting Photographer, where he mentions the super awesome Photocrati Theme. I am going to dig in a little more technical than his article, but I would love for you to check his article out as well. I say that because if all you want to do is display your photos then the easiest solution is Smugmug. Depending on the subscription level picked, Smugmug also allows for selling photographs. This is great for photographers wanting to sell prints in their photo businesses. An added benefit of Smugmug as a website solution is the lack of needed watching of the site for maintenance. The disadvantage of solutions like Smugmug is the difficulty it takes to customize a site design beyond the built in template options. That’s where Squarespace steps in to the mix. Squarespace is another subscription service where they manage and maintain your website. All you do is log in to create the content. Squarespace also integrates with Smugmug for photographers looking for a complete website solution without any technical skills, maintained or required. Of course if you want the website to look different from their built in templates then you have no choice but to hire a web developers to design and update the site for the new look. At the end of the day a Smugmug and Squarespace website can cost a couple to a few hundred dollars a year. That doesn’t include the 15% commission that Smugmug takes out of every print sale. For photographers looking for something easier to customize or something that more control is possible. That’s when I recommend WordPress as the option. In fact, many photographers I know use both WordPress and Smugmug together, but for the seamless design look it requires web development for the synchronized branding. When asked what WordPress is I typically summarize it as website software. Basically it is a CMS or content management system. It is software that allows you to easily change content using a visual editor similar to Microsoft Word or Google Drive. The CMS also allows added software to be installed within it. The added software, also known as themes and plugins, add new functionality and designs to the CMS. These play a role in what the website can do and how it looks. There are hundreds of thousands of themes and plugins available for WordPress. Many of which are free, but paid themes and plugins do exist. WordPress itself is free and open source software. That means you as a user can download it and install it on any website. You can also contribute to the code if you wanted, make suggested modifications, etc. The WordPress community is also extremely large which means that you will find users helping each other out all over the place. There I is a free forum that WordPress.org where users can seek help for sticky situations. Premium or paid themes and plugins typically come with premium support so you aren’t relying on a reply in the free community forum. The advantages of WordPress for a photography website include the extremely helpful and friendly aforementioned community, the ongoing updates for stability and improvements, the nearly unlimited options for designs both free and paid and practically any functionality you might want in a photography website. The biggest disadvantage of WordPress, however, is one that is easily solvable. With Smugmug or Squarespace you don’t have to think about maintenance like server outages or site speed. Those companies do the work for you because you’re paying them to. Because WordPress is free, you are on your own to find a hosting company to store your WordPress website. Typically hosting companies include one click installs for WordPress so only don’t have to be technical to install the software. But what about outages, updates and so on? Well there are many types of hosting styles for websites. There are inexpensive ones, medium range and very experience ones. There are shared hosts, virtual private servers, private servers, clouds and more. For the most part these all require you to maintain and update the software regularly. And what happens when the server goes out? You then have to contact the host to ask why and hope for a reply quickly. I have a solution I want to talk about. It’s called Managed WordPress Hosting. the idea there is that hosting companies create servers that are specifically optimized for the best performance when running WordPress. There’s a major advantage because you know that your site will run smoothly. You would also hope that the support team is extremely knowledgeable with WordPress so if you had an issue it could be resolved easily. So let’s talk about two very good options in this space. The first is Siteground. They are a very inexpensive hosting company that has Managed WordPress Host options. Their plans start at under $4 a month and the servers are perfect for photographers just getting started or those with low site traffic. Of course if you started there and your site became very popular with high traffic the it’s easy for Siteground to bump up your plan to the next level without any downtime. 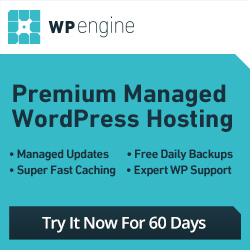 Another choice for photographers who need that extra “something” is WP Engine. With 99.99% uptime, and dedication only to WordPress (they will not allow use of other website software) they are amazing In my time with WP Engine my website has gone down less than a handful of times, each of which were out of their control. A pingdom speed test showing my current site load speed. Under 3 seconds is great but my goal is under 2 seconds. It’s very possible with a photography website. It’s simply a matter of optimized photographs, the right plugins and themes and a fantastic WordPress host. Let me explain that further. Smugmug only has to consider very external factors which are out of their control. These include operating systems like Windows or Mac. Along the same lines are browsers like Chrome or Internet Explorer. Smugmug has complete control over their own server environment so they can ensure the fastest possible speed and configuration for themselves. With WordPress it’s the users job to ensure these things. But there are additional factors to consider like the hosting environment. A shared host will be slower than a virtual private server, which will be slower than a private server, which is slower than when combined with a cloud and so on. To top it off, WordPress users have to consider how themes and plugins come into play for site speed. For example, there are many social sharing plugins for WordPress, but they typically come with a performance hit, which can slow down websites. So how would you counter that? My suggestion for photographers using WordPress is to start with or migrate to WP Engine. As mentioned, their hosting is dedicated to WordPess, so their servers are designed specifically for the software. In addition, they performance the most important updates for you. WP Engine will update the WordPress version for you, any free themes or plugins that you’re using will be automatically updated if there is a security problem. They will also prevent you from installing any plugins that are known for degrading the performance of websites. For example, Broken Link Checker is a very popular plugin for people needing to find any broken links on their website. If you install that on your site, then within a few hours you will receive a friendly note from WP Engine stating it will be removed automatically if you don’t remove it. They do that because although the plugin is popular, it’s a resource hog which runs the risk of slowing down a server. In addition to all I’ve said so far, the company only hires expert WordPress users. That means no matter who you are working with at the company. The person knows all there is to know about WordPress. And although they don’t officially provide support outside of their own hosting services, a quick unrelated WordPress question is very likely to be answered, and quickly. The biggest advantage that I notice with WP Engine, and I know other photographers would as well, is the site speed. At Photocrati we develop a WordPress theme for photographers in addition to WordPress plugins for photographers. Each of which include gallery management and display systems. Due to the nature of the software, they come with a performance hit naturally. Although the Photocrati developers are constantly working on speed improvements, part of the responsibility comes down to the user. Or more specifically, the user’s server and host. I’ve gone through the gamut of hosting options and companies. I have also interacted with thousands of photographers using the software and have see the impacts of various themes and plugins combined with servers. Yes there are some bad combinations. But there are ways to improve, things to look for and so on. The best thing I did, and strongly recommend others doing, is to go with a better WordPress host. So with all of that said – if you’re considering or already use WordPress for your photography website, consider switching to a Managed WordPress Host like WP Engine. It’s not the cheapest host around, starting at under $30, but the relief you get from knowing your site is online and secure is worth added price tag. The feeling you get when WP Engine support team answers a burning question is one to smile about. With the expert customer support and the free hack fixing guarantee, you’ll be saving money in the long run should anything go wrong. Downtime can be very costly if it takes you hours of your day to fix, or worse yet, hire someone else to fix. Of course if you he can’t afford the price tag, check out Siteground our another Managed WordPress Host option. For me, WP Engine has made my WordPress experience even better than it was before. Please check the out and of course, comment with any questions. Great article Scott….. I didn’t realize al these things need to ne considered when building a website.. Very informative! I’ve most recently updated my smugmug site and have to say after spending many hours figuring out the system I’m pretty pleased with it’s look… i will go back now and check out its performance based on the items you’ve talked about. I’m expecting it to check out fine. Again, thanks for your insight! Thanks man! Good luck with the new Smugmug site. You are right. There is no wrong or right in regards to a photographer Webpage. I currently run my own WP site but I will Switch over to Squarespace. The reasons are that running and maintaining my own wp site is much to time cosuming, I Need to take care of the updates, he backups and so on. I would Need to Change my theme anyway and squarespace has a solution that just fits right for me. So, my personal recomendation is either to use zenfolio or squarespace instead of Messing around with your own WP theme, especially if you don’t have anyone who could help if things are not working the way you want. If you don’t have anyone to help maintain the website, or if you don’t have the time to maintain it or if you’re just not technical enough – then yea WordPress may not be the best choice. But it’s by far the most flexible.